Photo: See Iyanya wedding gift to his boss Ubi Franklin. ~ CK Jacob: Nigerian Fiction And Lifestyle Blog. 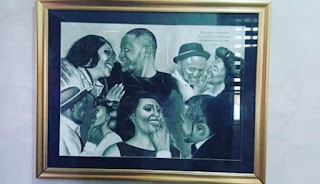 Photo: See Iyanya wedding gift to his boss Ubi Franklin. After the fabulous wedding of Lilian Esoro and Ubi Franklin, Iyanya presented this gift to his boss which he tagged as "The best gift ever"! The new couple have left the country for their honeymoon. the gift is beautiful..happy married life to them... i just pray his past with hitting women don't come knockn on the door..
R those pple supposed to be lilian and Ubi?? ?